2 What is Reflection / Reflective Practice? What is Reflection / Reflective Practice? "conscious and systematic approach to thinking about experiences with the aim of learning and changing behaviours." Clinical reflection is a tool which enables the individual to learn from their experiences and actions, this is not only applicable in the health care setting but through day to day life. It enables the individual to learn from mistakes and poor choices they take and acknowledge when things have gone well so this can be repeated; but to clinically reflect and utilise this skill in the health care setting needs some practice, as this requires critical thinking. It helps the therapist to figure out what is known already and then add the new information that was gained, resulting in better understanding, knowledge and a new meaning. 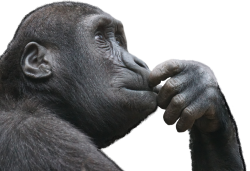 By "consiously looking and thinking about experiences, actions, emotions, feelings and responses" we can interpret them so that we can learn thus you become more critical about your views of practice and the world. Watch this video on reflective learning to find out more. It is encouraged that reflections are initially written; this will help to cement the different stages of reflection, but once this skill is developed health care professionals can do this regularly (internally) throughout the day. They then may only reflect formally (written) upon an event or activity that was particularly significant for them. Watch this small lecture from the London deanery on reflection and learning in the workplace. This is aimed at trainee doctors but the principles can be translated into any health care profession. after the event, thinking about "beliefs, expectations and biases"
"reflecting on practice while it is happening". it requires "conscious attention to the task"
There are many different frameworks offered for structuring reflection. Here is a powerpoint presentation that runs through a number of examples. Below are descriptions of some of the most common reflective frameworks and models that can be used. A recommended approach to find the best model to use is to practice with several different frameworks and choose the model or models which you feel are most effective for you in particular situations. Reflection is a very personal activity and so this choice should also be personal to ensure the greatest benefit to you. The section in the reflective cycle is describing the event that is being reflected upon. Is only needs to be short and precise to give background information on the event. This section focuses on thoughts and feelings at the time of the event and after. If it was a problem solving situation - was the issue resolved. If there are pieces of evidence for the event you are reflecting upon you can include these here. This section is where you can really demonstrate your reflection on the experience. Pick out points that you think have hindered or enhanced the experience. What went well, and what has not gone so well. Similarly to the evaluation section where references may have been incorporated, the analysis section is where you can link your experience to what the literature is reporting. This is where you will improve your grades if this is an academic piece of work, but also useful for using it as a piece of evidence in a portfolio for continued education purposes. This section is about summarising the outcome of the event being reflected upon. This section is essential to any reflection, this is about what you are going to do next. How are you going to implement the changes you have identified to achieve the desired outcome next time, be it performance improvement or maintaining the standard achieved. Causal - what essential factors contributed to this experience? Context – what are the significant background factors to this experience? Clarifying – what are the key processes (for reflection) in this experience? What was I trying to achieve? Why did I intervene as I did? The people I work with? How did I feel about this experience when it was happening? How did the patient feel about it? How do I know how the patient felt about it? What internal factors influenced my decision making? What external factors influenced my decision making? What sources of knowledge did/should have influenced my decision making? What choices did I have? What would be the consequences of these choices? How do I feel now about this experience? How have I made sense of this experience in light of past experiences and future practice? 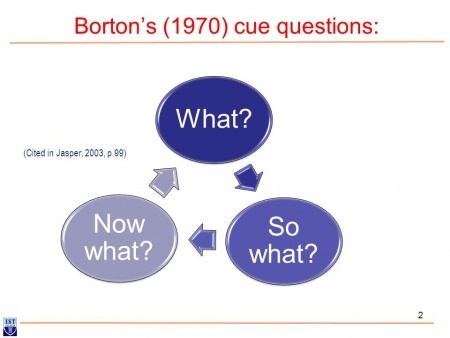 Borton's three Whats questions were mapped on to an experiential learning cycle by John Driscoll to form a simple a framework for supporting reflection. This framework is easy to remember and implement, and is therefore a popular option used by many health care professionals and advocated by professional bodies. What were the roles of the people involved? This is one of the most important sections of a reflection. This section focuses on what will you do next / what does your learning experience mean for future practice? How do you resolve the situation / improve the outcome? Now you have learnt about 3 of the main learning frameworks / reflective structures to use in clinical practice. It is important to understand that reflection is a skill that is developed through repeated practice. When selecting a model to use it is essential, as discussed previously, to try different structures and frameworks for different situations to learn which suit you and a particular context best. Day to day reflections (e.g. for CPD events) may be better suited to the Borton's framework, whereas for an academic piece of work or a significant incident at work, a more detailed framework such as Gibbs may be more appropriate. It is also important to review relevant literature as well as your own experience and anecdotal evidence and include this within your reflections to develop an evidence based practice approach in your reflective practice. ↑ Schön DA. 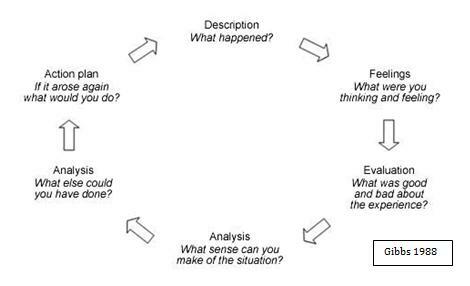 The reflective practitioner: How professionals think in action. Basic books; 1983. ↑ Borton, T. (1970) Reach, Touch and Teach. London:Hutchinson. ↑ Driscoll J. Reflective practice for practise. Senior Nurse. 1994;14(1):47.